Thrissur  (formerly Trichur) is a one of the largest city in the central part of Kerala in Southern India.It is known as cultural capital of Kerala, with numerous temples, churches, cultural institutions, art centers, museums etc. The city is most popular for its temple festivals, particularly the annual Thrissur Pooram known as festival of festivals. The city is located in exact geographic center of Kerala. Thrissur is one of the oldest cities in Kerala. The legend says, the city was the town created by Lord Parasurama (6th incarnation of Lord Vishnu) soon after formation of Kerala, by creating a large Shiva temple. The entire city is formed around the grand Shiva temple known as Vadakumnathan Temple. The city's original name was Thir-Shiva-Perur (Sacred city of Shiva), which got later shortened as Thrissur. The temple is in the center of a mega roundabout that is of 64 acres. This round is known as Swaraj Round and the giant square in front of the temple is known as Thekkinkad Maidan. All roads of Thrissur connect to this. Perhaps when Indians think of Thrissur, the first image would be the famous Thrissur Pooram festival, the most colourful and spectacular temple festival of Kerala. This is also known as largest temple festival in India. The festival is at the Vadakkumnathan temple grounds, in April or May. The city is equally famous for the final celebrations of the Onam festival, which is the national festival of Kerala. It hosts the famous Pulikali during Onam celebrations in August or September (depends on Malayalam calendar). Apart from festivals and culture, Thrissur is also well known as one of the best shopping centers in Kerala for silks and gold ornaments. The city is also known as Entrepreneurial City, due to presence of large number of entrepreneurs working in various trades. The city was a key Buddhist center in early centuries AD. During the imperial Chera period, the city was a key center of Chera Army, being the closest area to imperial capital at Thiruvanchikulam. With the collapse of Chera Empire, the city came under Perumpadappu Swaroopam, the dynasty that later founded Kochi Kingdom. The city area was abandoned after intense battles between Kochi Kingdom and Kozhikode's Zamorins. However it was a major scholastic center with several leading Hindu Nampoothiri families around the region proficient in Vedas and Ayurveda. From very early times Thrissur has been a centre of learning and, with the decline of Buddhism and Jainism and the establishment of the supremacy of Brahmanism during the revival of Hinduism, Thrissur became an important centre of Sanskrit learning. The great Sankara Acharya had taught Advaita here. After his travels in different regions of India he is believed to have come back and settled in Thrissur and died here. Sankara Acharya's disciples Hastamalaka, Thotaka, Padmapada and Sudhachara established in the town four Maddams, namely the Northern Madam, the Middle Madam, the ln-Between Madam and the Southern Madam respectively, all of which are extant except the In-Between one. The modern Thrissur city, owes its origin to celebrated Kochi King, H.H Sakthan Thampuran who transferred his capital from Kochi to Thrissur and founded the modern city. He crushed the feudal Nampoothiri chieftains who revolted against his regin, cleared the forests that surrounded around the temple and developed the Thekkinkadu Square and Swaraj Roundabout. He established his palace near to it and decided to develop into a major commercial avenue. He invited Christians merchants and Brahmins to settle in the new city and offered incentives to start business ventures. To ensure cultural activites, he initiated Thrissur Pooram which soon grew as festival of festivals. A numerous of reforms, soon made Thrissur one of the largest and popular cities in the region. The Kochi Kings ensured Thrissur remains pride of Kochi. Even today in late 19th century, the capital was shifted to Tripunithara, a suburb of Kochi, Thrissur remained as the largest city in the Kingdom. The city was center of political movements in the state. The King sooner declared Thrissur, the first municipal corporation region in Malayalam speaking region. The construction of Ramanilyam, the state guest house, soon made it epic-center of Congress Movement of Indian Independence in Kerala. In 1940s, Thrissur became venue of Akya Kerala Movement (United Kerala Agitation), to unify Malayalam speaking regions together. The Maharaja of Kochi H.H Kerala Varma made his historic speech in Thekkinkadu Maidan declaring the need of Kerala State and Kochi's commitment in establishing such, made the first concrete move towards unification process. After end of Monarchy and formation of Kerala, Thrissur became the cultural capital of the state. Leading cultural institutions of the state, like Sahitya Academy (State Academy of Literature), Lalithakala Academy (State Academy of Fine Arts), Sangeetha Nataka Academy (State Academy for Music and Drama), Kerala Kalamandalam, Jawaharbal Bhavan etc established its headquarters in Thrissur. Key institutions like Kerala Police Academy, Civil Defence Academy, Kerala Agricultural University, KILA etc made the city, one of the leading academic destination. Kochi International Airport, is 58 km away from Thrissur City with direct flights from the Middle East, Singapore, Maldives, Europe and Sri Lanka. Kozhikode Airport is 80 km away from Thrissur City. Kozhikode International Airport located 80 Kms away as well as Coimbatore Airport located 115 Kms away are other nearby airports, offering international connectivity as well as domestic connections. Thrissur City is well connected and serviced by rail to all major cities in India. Thrissur Railway Station is an major railway head in South India. Daily trains are avaliable to leading cities like Mumbai, New Delhi, Kolkata, Bangalore, Chennai, Mangalore and Hyderabad and almost every part of India. Kerala's largest Railway Junction- Shornur Junction is just 33 Kms away from the city and is considered as Rail Gateway of Kerala, where all trains from and to Kerala touches. You can also get in to Thrissur City by bus from cities like Kochi, Kozhikode, Kannur, Thiruvananthapuram, Coimbatore, Mangalore, Bangalore, Chennai and Mumbai. Thrissur is well connected by NH 544, NH 47,NH 17 and NH 66 to other cities like Kochi, Kozhikode, Chennai, Bangalore, Coimbatore, Madurai and Pollachi by road. Bus: Private bus service system and Government-run KSRTC is a good choice for travelling. .
Autorickshaw: Auto rickshaws are the main form of local transport, if you don't have your own means of transportation. Autorickshaws running in the city limits are to use fare meters, while the ones from the adjacent areas need not use them. However it is a rule that such autorickshaws without metres should not pick up passengers within city limits. There is a pre-paid auto rickshaw counter at Thrissur Railway Station. Taxi: Local taxis are also available at cheap rates. Please note that there are no local Taxis (Yellow cabs or the one's having yellow roof and black body). The taxis known as 'Tourist taxis' are meant for long travel or one day trips. Car: There are many car rental companies offering cars with drivers or self drive. Bike: Bikes are available for rental in Thrissur City. This is available for a week or more than that. Walk: Many places of attractions are near by each in the city limit other so you could walk between them. The Vadakummnathan temple is the most important attraction of the city. The giantic temple and historical structures have more than 1000 years of tales to tell. However the temple allows only Hindu devotees inside the complex and hence adherents of other religions can just have a glimpse from outside or take a photo in front of the massive gate tower, constructed in true specimen of Kerala architecture. For Hindu tourists (including people adhering to Buddhism, Jainism and Sikhism), the temple offers massive sightings. The temple has a collection of Mural paintings, some even 4 centuries old. The massive Nataraja Mural near the main gate, is known for its antiquity and still retains its original colors without much preservation. There are 3 shrines inside inner complex. The Shrine of Vadakkumnathan is located in left side. The Idol is covered completely under ghee, which have formed a mountain, due to continuous ablution of ghee (clarified butter) for centuries, without any incident of melting. On its right side, there is a shrine for Mahavishnu. In middle, an unique circular shrine is located for Shankaranarayan. The temple have one of largest Koothambalam (Dance Hall) constructed in unique Kerala Architecture. The Koothambalam has a massive pyramid like roofing. The Koothambalam hosts traditional performances called Nangyar Koothu. There are many numerous shrines outside. Opposite to Vadakummnathan, there are two other shrines, which are considered to be Sister temples of Vadakummnathan. The Thiruvambadi Krishna Temple and Paramekkavu Devi Temple are the key competitors and participants to the annual Thrissur Pooram. Definitely worth a mention is also the guruvayoor temple a prominent hindu pilgrimage centreof kerala,the third biggest in india in terms of number of devotees.Nearby is also a renowned elephant stable with more than a hundred elephants. Thrissur Pooram: The Pooram of all Poorams, is the most spectacular festival of this cultural capital celebrated at Vadakkumnathan Temple every year during April-May. Though non-Hindus are not allowed inside the temple, Kerala’s grandest temple pageantry, which includes colourful processions of caparisoned elephants and a midnight fireworks display, parasol exchanges, drum concerts can be witnessed from the crowded streets of Thrissur City. The two devaswams- Thiruvampadi and Paramekkavu- explore and exploit every source at their command to make this annual festival a memorable one. It is celebrated with a colourful procession of caparisoned elephants, parasol exchanges, drum concerts, display of pyro-techniques and refreshing scenes of public participation. During the festival season, Thrissur, popularly known as the temple town turns into a town of colour, music and mirth. Tourists (with passport), can sometimes get special tickets to this event offered for free which allow them entry onto a 'Guests' viewing platform which has a great view of the whole event. To get these tickets you'll meed to take your passport to the tourist office, which is about a 10 minute north of the central temple where the festival takes place. If you do get these tickets, arrive early as the seating is unassigned and often over sold. The main festivities of elephants and the parasol showdown run from about 5pm to 7pm. If you are only in town for a day, don't take your backpack with you, it's much too crowded. You can leave it at the train station coat check securely. To do so you will need locks on all parts of your bag (needed by the guard to accept your bag, and easily bought for about Rs30 from a small corner store seller just up at the top of the steep railway rd), a train ticket (28rs to erankulam worked fine), and ID for them to write down. Puli Kali: This event happens on the fourth day of Onam, where Puli Kali troupes from all over the Thrissur City assemble to display their skills. 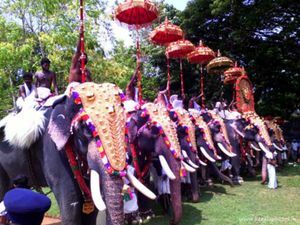 Aanayoottu (Feeding of elephants): It's a festival held in the precincts of the Vadakkunnathan temple in Thrissur C, The festival falls on the first day of the month of Karkkidakam (timed against the Malayalam calendar), which coincides with the month of July. Feast of Saint Raphael, Ollur: This is an annual festival held in Ollur, near Thrissur City, since 1839. It draws thousands of pilgrims. Peruvanam Pooram:This time you are invited to be part of a festival that will narrate to you a history of more than 1500 years. During the Malayalam month of meenam (roughly April) Peruvanam temple in Cherpu attains a special charm and majesty for it is the time of the Peruvanam pooram, a festival that has a legendary status for its antiquity. According to legends the festival was started in a different form which went on for several years after which it was stopped for unknown reasons. Later it was restarted as two poorams, Peruvanam pooram and Arattupuzha pooram. It is estimated that the new version has been in existence for 1428 years. The procession carrying the deity atop a caparisoned elephant along with six other jumbos accompanied by traditional percussion ensembles is a real treat for both your eyes and ears. There are many small houses in the small lane near Dolors Basillica which specilizes in selling fresh vellayappams and other delicacies. One should definitely try the delicacies from there. Much of the budget accommodation is on the southern streets coming away from the temple. Some from Rs 150 at not peak times. During peak times like the yearly Poorum festival, expect accommodation prices to skyrocket to above Rs 3,000 and many places to be booked out in advance. Other alternatives during peak times are to stay at Guruvayoor, connected by 40 minute train, which has ample accommodation. Thrissur City is generally a safe city for a regular tourist. Take the precautions which you would be regularly taking in various other small cities in India. Beware of Pick pocketing. Certain areas near the bus terminal and railway stations may not be a good place for women moving around alone in the nights. Thrissur City has nine police stations. The East Police Station located in between the Municipal Bus Stand and 'Sakthan Thampuran' Bus Stand. The West Police Station is located at the suburb of Ayyanthole just next to the District Collectorate (H.Q of the civil administration). The Traffic Police Station is just opposite to the East police station quite close to the Police Club and the Fire Station. Regular patrols of the law and order and the traffic police are present in various parts of the city. For any emergency support of Police, ☎ 100 for Flying Squad or ☎ 1090 for Crime Stopper or ☎ 101. The City has nine Police Stations. Thrissur Railway Station is a major station in the Southern Railway network and all important trains stop here. Regular train services are there to Cochin and Palakkad are available from here. Thrissur also has a suburban station Punkunnam, but only local passenger trains and a few express trains stops here. The 'Sakthan Thampuran' Bus Stand located at the Southern part of the city is the origin point of buses proceeding towards Palakkad.The 'Municipal Bus Stand' located at Round South caters to the local bus transport. From North bus stand, there are buses which goes to Shoranur and Palakkad. The bus station of the state owned Transport corporation (KSRTC) is located at Chettiyangadi and is quite close to the Railway Station. This page was last edited on 15 March 2019, at 06:57.